Restaurants across the US are waking up to the whiff of strong coffee along with servings of a healthy and nutritious breakfast. Breakfast foods are reinventing themselves and have taken an important role in the eating habits of restaurant goers at a time when the spicier spread of fast food chains are falling out of favour. Breakfast sits at the crux of an abundance of overlapping trends, and from our desire to eat protein-heavy, healthy and nutritious food. Being the first meal of the day, it is a neccessity, not an indulgence. And the best part is that it can be prepared, served and consumed in the most convenient way. Interestingly, it is the reputed fast food chains who have taken the initiative.The introduction of all-day breakfast at McDonald’s last year has been a major boon for the company’s turn around efforts, helping the chain to get back to increase in the sales (after two years of decline ). Taco Bell’s US business has around 6% turnover in breakfast menu. Likewise, Burger King has introduced its egg-burrito within its breakfast menu. Subway has gone a step forward by promoting their breakfast menu in offering a free sandwich to customers who come in before 9am to select their regular breakfast menu. This is a big hit with office goers. The above graphs indicate that while breakfast & late evening snacks traffic has grown over the years, the traffic for lunch and dinner meals have remained flat or declined. NPD Research further states that the restaurants’ footfall have increased by a whopping 60% in the five year period. National Research Association’s findings show that ethnic fare is preffered by most customers. There is a symbiotic equation between the rising number of migrants in the US and their food preferences. Consumer trends reveal a rising demand for fruit juices, coffee, wider choice of beverages in healthy options, at different times of the day. This will inevitably push up profits and growth for the restaurants. The unstandadized lunch and dinner preparations of QSR chains have diluted its quality and impeded demand. Thus, a resurgence in fresh breakfast menu was but waiting to happen. Breakfast menus are easier to prepare and serve than assorted lunch & dinner items. Therefore, labor and raw material costs are lower. Eggs or bread or bacon never costed much anyway ! Technomics, another research agency, stated that 38% diners between age group 18-34 enjoy breakfasts in seemingly lunch items of pizza burgers and grilled chicken sandwiches in which were added breakfast ingredients. Datassential, yet another survey, reveals that Kale Salad, originally a lunch item, is more popular for breakfast by customers. Likewise, Grain Bowls sales at breakfast have increased 400% from 2012 to 2017. Unlike other meal times like lunch or dinner, the breakfast is one meal where most people are inclined to healthy eating with nutrition . Hence, restaurants which can start business hours early, with a pre-planned cost-revenue analysis , and ofcourse, healthy food offerings are likely to be immensely successful. 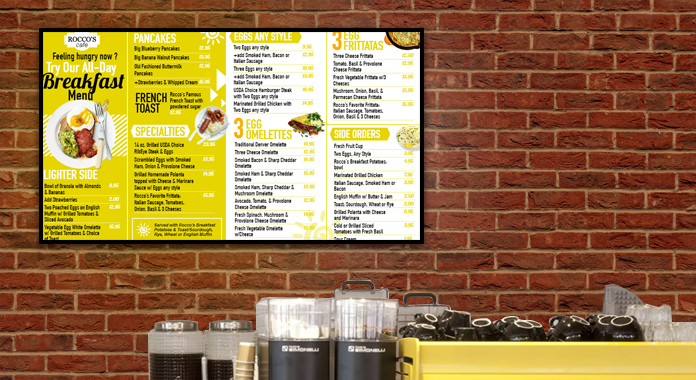 The digital menu board plays a crucial role in POS advertising and promotions. Appetizing graphics and images makes the menu board visually appealing and enticing for the target customers. Since the breakfast menu is displayed for early mornings, greetings by way of ‘good morning’ or a cup of coffee offered gratis can help the restaurant gain passerbys and anyone as customers. A picture frame menu board will be ideal to highlight certain menu items and up-sells. If the breakfast has a wide spread, the restaurateur can operate a playlist on the menu board to entice customers. Certain lunch and dinner items , which aren’t doing well at those times can be re-invented with breakfast ingredients and marketed through the digital menu board. Fresh fruits and veggies, along with fruit juices and health beverages could be sold at a premium at breakfast time. Its the restaurant’s prerogative after all. Digital software advancements have enabled the restaurateurs to update their menus remotely, anytime and from anywhere. Hence, he can coordinate the restaurant’s early morning activities from his residence itself. While the allure of breakfast foods, and being able to eat them any time of the day is not new. Given the ease of drive thru windows and the Americans’ busy life, breakfast has become the on-the-go, inexpensive meal. Whipping longevity into the trend is the fact that breakfast has a distict psychological advantage over other mealtimes. Breakfast has the reputation of being a smart and healthy way to start the day. It is more a neccessity than an indulgence. Hopefully, this simple truth will make many restaurants and their customers healthy and wealthy in the years to come.